On his return to the Great Place at Mqhekezweni the King was furious and said if he didn’t return to Fort Hare he would arrange wives for him and his cousin Justice. They ran away to Johannesburg instead, arriving there in 1941. There he worked as a mine security officer and after meeting Walter Sisulu, an estate agent, he was introduced to Lazer Sidelsky. He then did his articles through a firm of attorneys, Witkin Eidelman and Sidelsky. In 1944 he married Walter Sisulu’s cousin Evelyn Mase, a nurse. They had two sons, Madiba Thembekile "Thembi" and Makgatho and two daughters both called Makaziwe, the first of whom died in infancy. He and his wife divorced in 1958. Nelson Mandela rose through the ranks of the ANCYL and through its efforts, the ANC adopted a more radical mass-based policy, the Programme of Action in 1949. Nelson Mandela was arrested in a countrywide police swoop on 5 December 1955, which led to the 1956 Treason Trial. Men and women of all races found themselves in the dock in the marathon trial that only ended when the last 28 accused, including Mandela were acquitted on 29 March 1961. On 21 March 1960 police killed 69 unarmed people in a protest in Sharpeville against the pass laws. This led to the country’s first state of emergency and the banning of the ANC and the Pan Africanist Congress on 8 April. Nelson Mandela and his colleagues in the Treason Trial were among thousands detained during the state of emergency. During the trial Nelson Mandela married a social worker, Winnie Madikizela, on 14 June 1958. They had two daughters, Zenani and Zindziswa. The couple divorced in 1996. 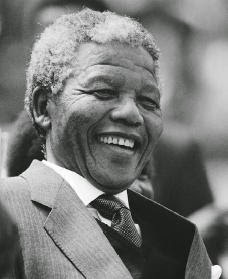 Days before the end of the Treason Trial Nelson Mandela travelled to Pietermaritzburg to speak at the All-in Africa Conference, which resolved that he should write to Prime Minister Verwoerd requesting a national convention on a non-racial constitution, and to warn that should he not agree there would be a national strike against South Africa becoming a republic. After he and his colleagues were acquitted in the Treason Trial Nelson Mandela went underground and began planning a national strike for 29, 30 and 31 March. In the face of massive mobilisation of state security the strike was called off early. In June 1961 he was asked to lead the armed struggle and helped to establish Umkhonto weSizwe (Spear of the Nation) which launched on 16 December 1961 with a series of explosions. On 11 January 1962, using the adopted name David Motsamayi, Nelson Mandela secretly left South Africa. He travelled around Africa and visited England to gain support for the armed struggle. He received military training in Morocco and Ethiopia and returned to South Africa in July 1962. He was arrested in a police roadblock outside Howick on 5 August while returning from KwaZulu-Natal where he had briefed ANC President Chief Albert Luthuli about his trip. He was charged with leaving the country without a permit and inciting workers to strike. He was convicted and sentenced to five years' imprisonment which he began serving in the Pretoria Local Prison. On 27 May 1963 he was transferred to Robben Island and returned to Pretoria on 12 June. Within a month police raided Liliesleaf, a secret hide-out in Rivonia used by ANC and Communist Party activists, and several of his comrades were arrested. In April 2007 his grandson Mandla Mandela was installed as head of the Mvezo Traditional Council at a ceremony at the Mvezo Great Place.